The cold is finally tapering down and my energy and enthusiasm is increasing, at least to the point where I can do other things than blow my nose, have another cough drop, and drink tea. My IQ has also returned to a measurable level, enabling me to plan the color study in more detail. Hue schemes. This basically amounts to “what color-wheel colors are in this piece?” There are a huge number of hue schemes, such as monochromatic (one color), analogous (colors from a 1/3 wedge of the color wheel), complementary (two colors from opposite sides of the color wheel), split complementary, triadic, tetradic, hexad, and probably a couple others that I’ve forgotten. Value schemes, i.e. how much light color vs. how much dark color and how wide a range of values is used. Deb Menz covers this in pretty good detail in her excellent book Color Works. Towards this, I’ve wound a 13-yard warp which will be painted in a different set of three colors every 24 inches (for a total of 17-18 color combinations). I’ve selected the warp colors to cover as many hue, value, and chroma schemes as possible. Obviously it’s impossible to touch on more than a tiny number of the possibilities! so I’m trying to get a small sampler. If I find a color scheme that speaks to me, I’ll probably do a follow-up study to investigate it in more detail. The weft colors are purely tentative, and I expect I’ll change them on the fly as I actually start weaving. However, I do intend to dye all those colors, so I can use them according to whim. A quarter-inch section of white will separate the groups. Weft-wise, the default plan is to weave the stripes “as drawn in”, to produce the proportion gamp I talked about in my previous post. However, I’m sure that plan will last about eighteen inches into the weaving, and that’s fine. I just need something to start with! Here is the starting drawdown, showing what would happen if woven “as drawn in” with the same set of colors. The actual cloth will have very different colors, of course, but you can get some idea of the warp striping and its effects. Structure? Good question. I have a LOT of options, because I’ve put each stripe within a group on an independent set of shafts. Stripe #1 is threaded on shafts 1-4, stripe #2 is on shafts 5-8, and so on. There are a total of 8 stripes (32 shafts) in each group. The white separator stripes and the selvages are each on their own set of shafts as well. (Ah, the luxury of 40 shafts!) So…I could weave every stripe in a different structure. Is your mind reeling yet? Mine is. 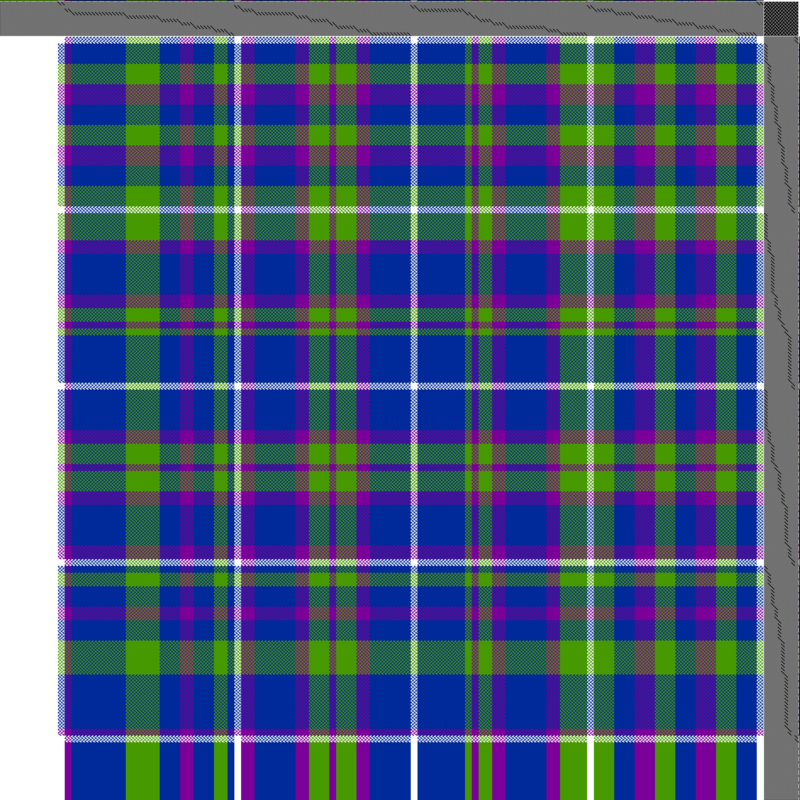 All that said, for simplicity’s sake, I plan to start with a 2/2 broken twill structure. There are a ton of things to explore without going down the rabbit hole of structure! But I’m keeping my structure options open in case I get the urge to fiddle. I do have a plan for getting the warp painted, but I’ll leave it for later as this blog post is already reaching heroic lengths. This week I’ll be working on tying off sections of the warp and prepping the warp for painting – the actual painting will likely take place next weekend, as it’s complicated, fussy, and time-consuming. It is so nice to have energy again! Finally, your kitten for the day! You may recall a previous photo of Fritz with his head stuffed completely into my shoe. 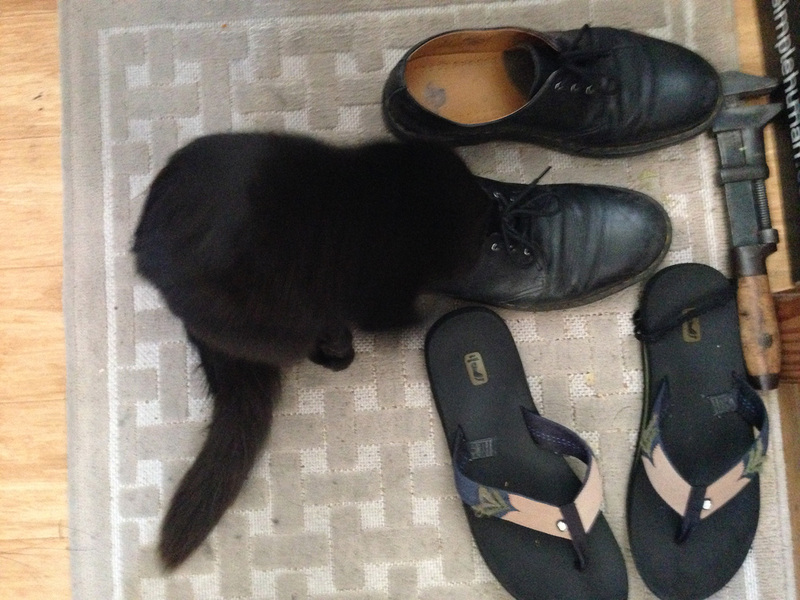 Well, kittens grow, and his head is now too large to fit into my shoe. Which is why he was so ecstatic a week or two ago, when my friend Alfred (who has much bigger feet) came over. I don’t know where he got his shoe fetish, but it’s pretty funny. Fritz exposing his secret fetish! I had not seen it before! It looks really interesting; thanks for sharing it!